*Please note, bulk discount will be applied in the basket and at the checkout. 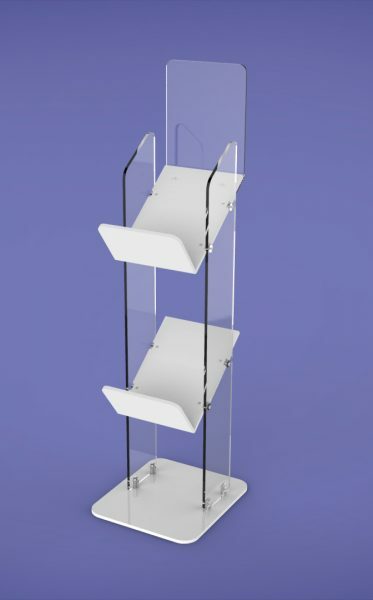 Super Tough Magazine Stands two Shelf designed and manufactured by GJ Plastics. 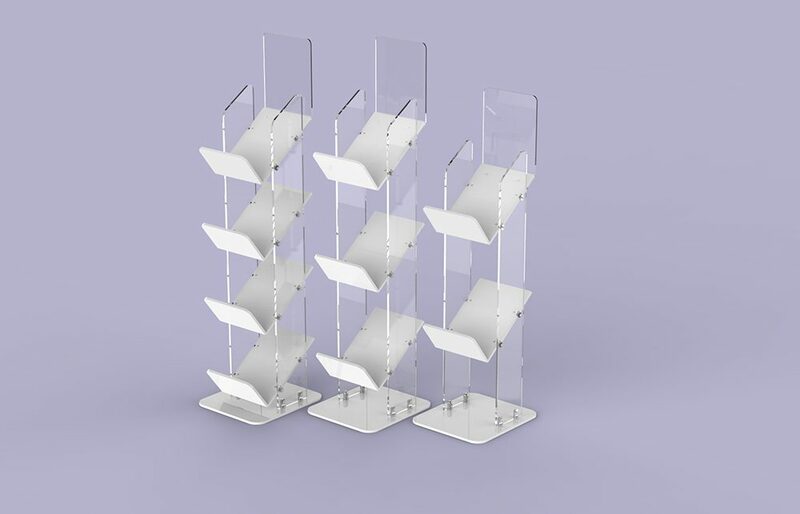 The super tough magazine stands made from a combination of Perspex® Acrylic for the sides and header and super tough white 9 mm Polypropylene for the four shelves and the base. 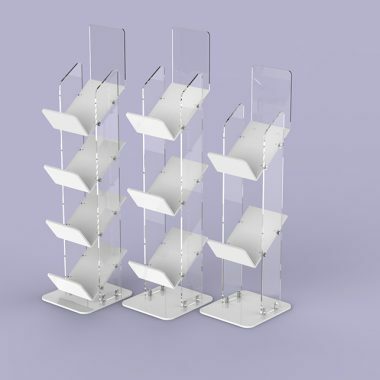 Super Tough Magazine Stands two Shelf provide you with a display that offers you high visibility for your papers but also extreme toughness of the shelves and base made in Polypropylene. 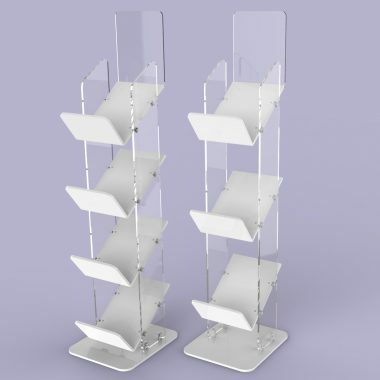 The attractive looks of this magazine display stand have been proven to increase the level of sales. 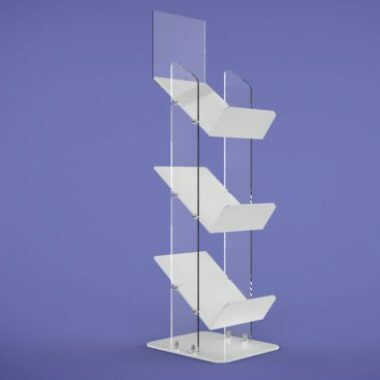 The shelves and base made in 9 mm thick Polypropylene; the material is extremely tough to easily withstand the day to day knocks throughout its life cycle. Made from 8 mm thick Perspex® Acrylic to provide high visibility of your tabloid or magazine publications. 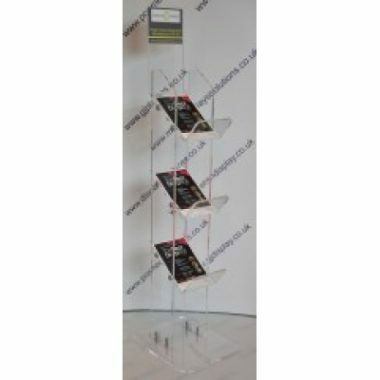 The header supplied for all Super Tough Magazine Stands two Shelf made from 5 mm thick High Impact modified Perspex® Acrylic. Two off Shelf size 32 cm by 23.5 cm with a lip size of 14 cm. They will fit both standard A4 and American A4 magazine sizes. Floor area 37 cm by 33 cm. For an additional cost, you can brand the stand. Please note all prices are for the customer sending artwork ready branding and all artwork origination. Delivery of super tough magazine stands. The Super Tough Magazine Stands two Shelf delivered flat packed. The components connect to each other by our designer aluminium brackets and machine screws. Suggested usage for Super Tough Magazine Stands two shelf. These high quality stands used by Magazine publishers, retail outlets, supermarkets, events and many more locations. GJ Plastics have sold the Super Tough Magazine Stands two Shelf in many countries. Product Designed and Made in UK. GJ Plastics designed and only manufacture this product in Britain to ensure high standards maintained. Where to position your Super Tough Magazine Stand two shelf? 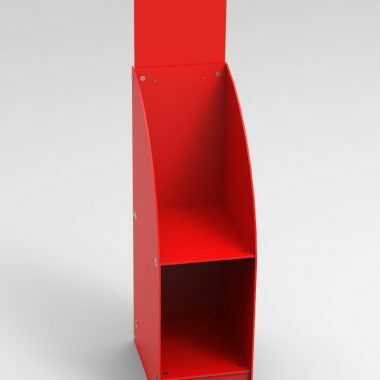 The ideal spot to place your Super Tough Magazine Stands two Shelf is in an high footfall area. Often you will find magzine stands in retail stores or near the checkouts in supermarkets or the entrance. They are a beneficial way of promoting your magazine or trade papers at events or exhibitions. Allows for impulse buying from your customers to add value to the overall spend. How many magazines will each shelf hold? To determine this measure, the thickness of your magazine then divide the height of the shelf lip by the magazine thickness to tell you the maximum yield. 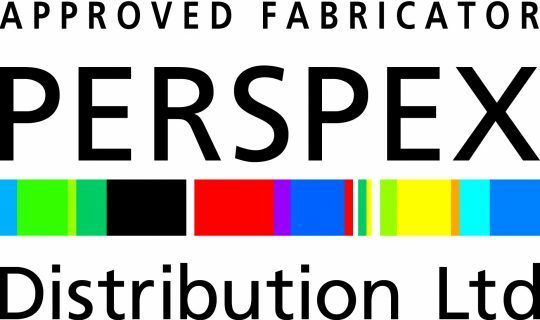 GJ Plastics are an authorised, approved fabricator for Perspex®.